This happened one weekend we spent on the water in Murrels Inlet. After a walk on the beach and then hanging out for a while I decided to take a look at the keel. I wanted to see it in both up and down position and to mark the cable at the winch in the fully up and down positions. I’m still not sure what happened, but in raising the keel, the cable snapped in half. Luckly the keel was only about a third or half the way up. It still made a hell of a bang and shook the whole boat. 550 lbs of keel slamming down is an eyeopener and heart accelerator. I popped the inspection port open on the well the keel mechanism is in and the cable had snapped about 6 inchs from where it attaches to the swingkeel . I don’t think that the cable touches / or is supposed to touch anything there. There didn’t seem to be any corrosion either. I don’t know if it was defective cable or if there is something wrong with the winch and pulley system that it runs on. There was nothing we could do for it there and I didn’t know how I was going to get it back on the trailer. It was looking as if we would have to find a marina to put her in to get fixed. It is was starting to look like an expensive weekend. The tide was still rising so we were able to get back to the public boat landing in murrels inlet without a problem. With the help of another daysailor that was putting his boat in the water we decided to drag the “Comes around, Goes around” up on the trailer. It is a very nice facility and at high tide the keel didnt start to hit the ramp till just a couple feet behind the trailer with it backed as far down as we could get it. After getting her partway onto the trailer dragging the keel up and over the rear beam of the trailer (patty at the wheel of the van) we winched her the rest of the way. 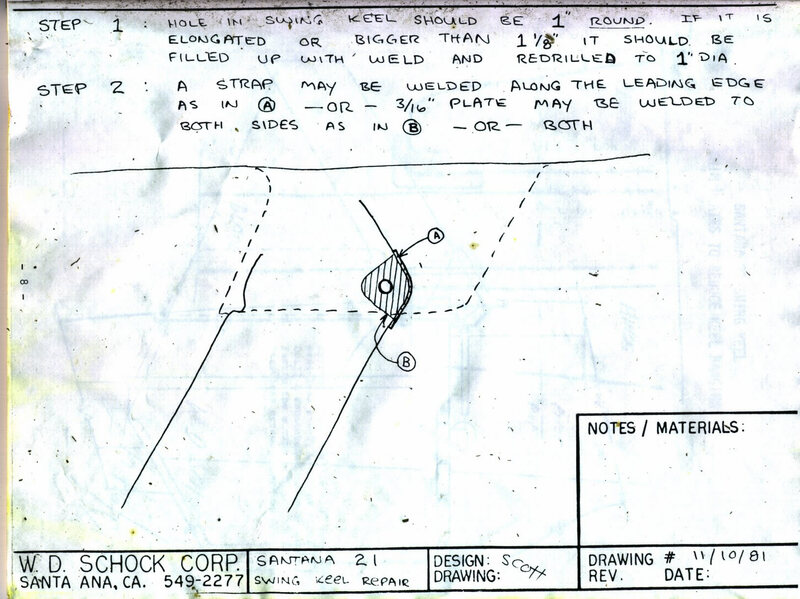 The keel went right into the keel pocket on the trailer. To be honest it was not any harder than normal to get her on the trailer. Just a lot more un-nerving. I had a scuba-mask on and kept a close eye on the procedings from underwater. Once we got the keel over the end beam of the trailer there was no going back. It would hang on the trailer going backwards. In the end though all went well and we pulled her out. 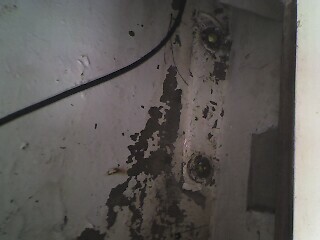 first two of these bolts from aft thru the storage under the seat that faces aft on the port side. inch plugs to put in the holes later. done they used lots of epoxy to bed the the keel in and it had totally surronded the bolts holding them in. It tooks some serious banging with the sledge hammer to get them out. In the process one bolt and nut were stripped. We didn’t get the nut far enough back on the bolt before hitting it. We later used a tap and die to fix the threads on the bolt and nut so that we could put it back together. 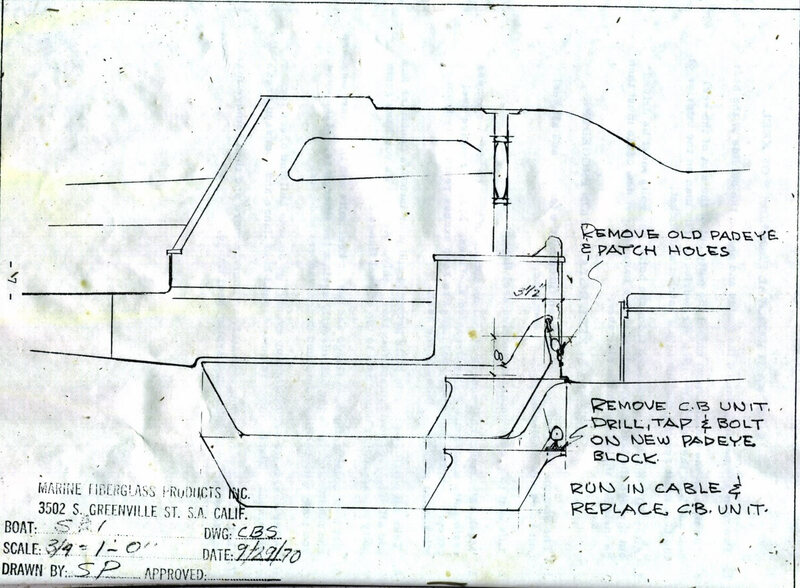 Here are some diagrams of the keel setup. 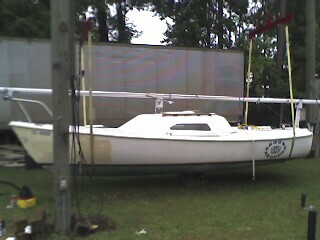 hoist to pick the keel off the trailer so we could work on it. buy even at 15 dollars. sat over night and then I put the second coat on it the next morning. This stuff rocks. Its a two part epoxy paint and goes on very thick. it. I think it cost me about 34 dollars for the 1 quart kit that I got. back out near the boat and left it over night. he went with me and we put the keel back on Comes Around, Goes Around. where it is being drawn against the boat. on trailer with leftover paint. 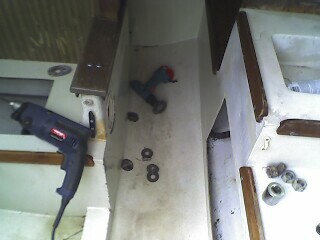 put keel back out on trailer by boat. whatever is needed to fix it. Things I would do differently if I had it to do over again. Build my own lift in my yard. ( I will be doing this anyway now) All it would take is 4 4x6s 16 or 20 ft long. saved about 160 dollars and 2 days time. the lift inside. This added two days to the time it took to get done. time…. so at least one can call for help if something goes wrong. 🙂 lol don’t know if he wants it on the internet or not. you won’t meet a nicer people.